This app offers guests the option to order products themselves when seated in a restaurant, bar or terrace. Thanks to a QR code you have direct access to the menu as a guest. You scan the code with your smartphone and you can directly order your favorite drink. For restaurants the app is the perfect solution to receive orders and optimize the contact with your guests. 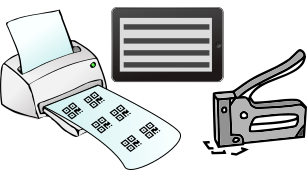 Receive orders in 5 minutes in your restaurant when you have a printer, a staplegun and a tablet!